Trilobites are hard-shelled, segmented members of the phylum Arthropoda and the class Trilobita that appear in the fossil record for almost 300 million years—from about 540 to 251 million years ago (mya). They existed throughout almost all of the Paleozoic era, flourishing in the earlier part of it and slowly declining in the later part, finally going extinct in the Permian-Triassic extinction event about 251 mya. The most common trilobites were about 2-7 cm (1-3.5 in) in length, but over their long history they ranged in size from 1 mm-72 cm (.04 in-28 in) and exhibited so much variation on their basic body plan that they are classified into nine (or possibly ten) orders with more than 15,000 species. The smallest species are presumed to have been part of the free floating plankton, while the more common, mid-sized species probably walked along the sea floor filtering mud to obtain food, and the larger varieties may have been swimming predators. The trilobites are considered to be the first animals to have evolved true eyes. Trilobites are thought to represent an early stage in the step-by-step development of life on Earth, but there remain alternative views about their precise cladistic connection to current species. Chaisson (2005) notes, for example, "though all trilobites have been extinct for the past 200 million years, paleobiologists are reasonably sure that some version of them gave rise to most of today’s animals." Others would assert that the trilobite line itself left no descendants, but that ancestors of the trilobites would also have given rise to species that became today's horseshoe crabs. 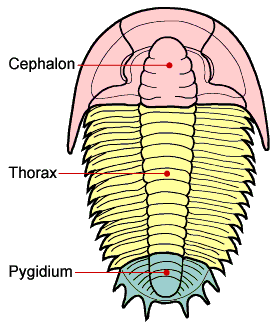 The bodies of trilobites are divided into three parts or tagmata: A cephalon (head) comprising the two pre-oral and first four post-oral segments completely fused together; a thorax comprising several freely articulating segments; and a pygidium (tail) comprising the last few segments fused together with the telson (last division of the body). The pygidia are still fairly rudimentary in the most primitive trilobites. The thorax is fairly flexible—fossilized trilobites are often found curled up like modern woodlice, perhaps for protection. Trilobites had a single pair of pre-oral antennae and otherwise undifferentiated biramous (double-branched) limbs. Each exopodite (walking leg) had six segments, analogous to those of other early arthropods. The first segment of each walking leg also bore a feather-like epipodite, or gill branch, which is considered to have been used for respiration and swimming. "Above" the limbs were lateral projections called left and right "pleural lobes," extending outward from a central "axial lobe." Contrary to popular belief, it is this longitudinal tripartite division into left and right pleural lobes and a central axial lobe that gives trilobites their name, not the latitudinal division into cephalon, thorax, and pygidium. The name "trilobite" (meaning "three-lobed") is based on its three longitudinal lobes: The left pleural lobe, the central axial lobe, and the right pleural lobe. 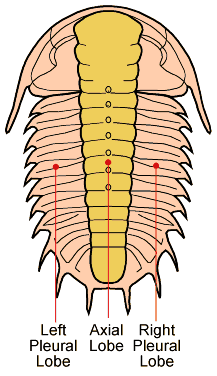 The trilobite body is divided into three major sections, a cephalon with eyes, mouthparts, and sensory organs such as antennae; a thorax of multiple similar segments (that in some species allowed the organism to curl up); and a pygidium, or tail section. Although trilobites were armored only on top, they still had a fairly heavy exoskeleton, composed of calcite and calcium phosphate minerals in a protein lattice of chitin. 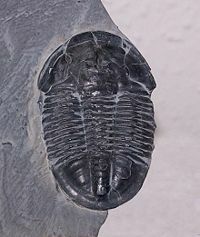 Unlike other groups of armored arthropods, which resorb most of their skeletal minerals prior to molting, a trilobite would cast off a fully mineralized molt. Thus, a single trilobite animal could potentially have left multiple well-mineralized skeletons behind—further enhancing the apparent abundance of trilobites in the fossil record. During molting, the exoskeleton generally split between the head and thorax, which is why so many trilobite fossils are missing one or the other: Many trilobite fossils are actually molted exoskeletons rather than dead trilobites. In most groups, there were two facial sutures on the cephalon to make shedding easier. The cheeks of the cephalon usually also supported a pair of crescent-shaped compound eyes, which were surprisingly advanced in some species. In fact, trilobites are considered to be the first animals to evolve true eyes, about 543 million years ago; the evolutionary appearance of eyes has been postulated as a trigger for the Cambrian Explosion. Some trilobites, such as those of the order Lichida, evolved elaborate spiny forms from the Ordovician period (488-444 mya) until the end of the Devonian period (416-359 mya). Examples of these specimens have been found in the Hamar Laghdad formation of Alnif in Morocco. Collectors of this material should be aware of a serious counterfeiting problem with much of the Moroccan material that is offered commercially. Spectacular spined trilobites have also been found in western Russia; Oklahoma, U.S.; and Ontario, Canada. These spiny forms could possibly have been a defensive response to the evolutionary appearance of fish. According to New Scientist magazine (May 2005), "some… trilobites… had horns on their heads similar to those of modern beetles." 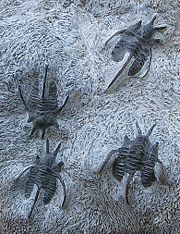 Based on the size, location, and shape of the horns, Rob Knell, a biologist at Queen Mary, University of London and Richard Fortey of London's Natural History Museum, concluded that the most likely use of the horns was combat for mates, which, if true, would make trilobites the earliest exemplars of this behavior. Trilobites range in length from one millimeter to 72 cm (1/25 inch to 28 inches), with a typical size range of two to seven centimeters (1 to 3½ inches). The world's largest trilobite, Isotelus rex, was found in 1998, by Canadian scientists in Ordovician rocks on the shores of Hudson Bay. Many trilobites had eyes, while some trilobites lacked eyes, probably living too deep in the sea for light to reach them. Others, such as hacops rana, had eyes that were quite large. Trilobites also had antennae that perhaps were used for taste and smell. 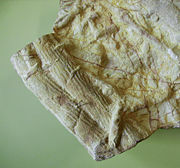 The eyes of trilobites were made of calcite (calcium carbonate, CaCO3). Pure forms of calcite are transparent, and some trilobites used a single crystallographically oriented, clear calcite crystal to form the lens of each of their eyes. In this, they differ from most other arthropods, which have soft or chitin-supported eyes. The rigid calcite lenses of a trilobite eye would have been unable to accommodate to a change of focus, like the soft lens in a human eye would. However, in some trilobites, the calcite formed an internal doublet structure, which in principle could have given a good depth of field with minimal spherical aberration. A living species with similar lenses is the brittle star Ophiocoma wendtii, an echinoderm. The trilobite eyes were typically compound, with each lens being an elongated prism. The number of lenses in such an eye varied, however: Some trilobites had only one, and some had thousands of lenses in a single eye. In these compound eyes, the lenses were typically arranged hexagonally. Three different types of trilobite eyes have been identified: holochroal, schizochroal, and abthochroal. Holochroal eyes had a great number of (tiny) lenses (sometimes over 15,000), and are found in all orders of trilobite. These lenses were packed closely together (hexagonally) and touch each other without being individually mounted and support in sclera, which would have been comparable to the white layer covering the eyes of most modern arthropods. A single corneal membrane covered all the lenses. Schizochroal eyes typically had fewer (and larger) lenses (to around 700), and are found only in the order Phacopida. The lenses were separate, with each lens having an individual cornea which extended into a rather large sclera. Abathochroal eyes had few (and small) lenses (to around 70), and are found only in Cambrian Eodiscina. Each lens was separate and had an individual cornea. The sclera was separate from the cornea, and did not run as deep as the sclera in schizochroal eyes. From the fossil record, the following trilobite life cycle has been reconstructed. From a hatched egg came a tiny larva called a "protaspid" in which all segments were fused into a single carapace. Subsequently a fold developed in the carapace and thoracic segments were added in successive molts during an intermediate stage called "meraspid." Finally, the adult number of segments was reached, at which point the animal is called a "holaspid." In many species, molting continued during the holaspid stage with no changes in segment number. Trilobite larvae are reasonably well known and provide an important aid in evaluating high-level phylogenetic relationships among trilobites. When describing differences between different taxa of trilobites, the presence, size, and shape of the cephalic features are often mentioned. Figure 1 shows gross morphology of the cephalon. 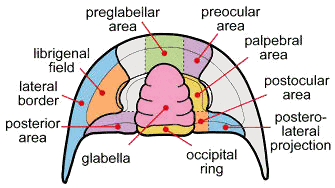 The cheeks (genae) are the pleural lobes on each side of the axial feature, the glabella. 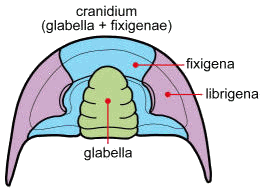 When trilobites molted or died, the librigenae (the so-called "free cheeks") often separated, leaving the cranidium (glabella + fixigenae) exposed. Figure 2 shows a more detailed view of the cephalon. Based on morphological similarities, it is possible that the trilobites have their ancestors in arthropod-like creatures such as Spriggina, Parvancorina, and other trilobitomorphs of the Ediacaran period of the Precambrian. There are many morphological similarities between early trilobites and other Cambrian arthropods known from the Burgess Shale and other fossiliferous locations. It is reasonable to assume that the trilobites share a common ancestor with these other arthropods prior to the Ediacaran-Cambrian boundary. The exact reason for the extinction of the trilobites is not clear, although it would seem to be no coincidence that their numbers began to decrease with the arrival of the first sharks and other early fish in the Silurian and Devonian periods with their strong, hinged jaw. Trilobites may have provided a rich source of food for these new arrivals. Additionally, their relatively low numbers and diversity at the end of the Permian no doubt contributed to their extinction during that great mass extinction event. Foreshadowing this, the Ordovician mass extinction, though somewhat less substantial than the Permian one, also seems to have significantly reduced trilobite diversity. The closest extant (living) relatives of trilobites may be the cephalocarids, minute marine crustaceans (Lambert 1985) and the horseshoe crabs. Trilobites appear to have been exclusively marine organisms, since the fossilized remains of trilobites are always found in rocks containing fossils of other salt-water animals, such as brachiopods, crinoids, and corals. Within the marine paleoenvironment, trilobites were found in a broad range, from extremely shallow water to very deep water. The tracks left behind by trilobites crawling on the sea floor are occasionally preserved as trace fossils. Trilobites, like brachiopods, crinoids, and corals, are found on all modern continents, and occupied every ancient ocean from which fossils have been collected. Trilobite fossils are found worldwide, with many thousands of known species. Because they evolved rapidly, trilobites serve as excellent index fossils, enabling geologists to date the age of the rocks in which they are found. They were among the first fossils to attract widespread attention, and new species are being discovered every year. Some Native Americans, recognizing that trilobites were water creatures, had a name for them which means "little water bug in the rocks." 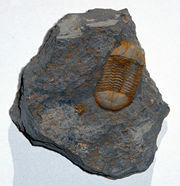 A famous location for trilobite fossils in the United Kingdom is Wren's Nest, Dudley in the West Midlands, where Calymene blumenbachi is found in the Silurian Wenlock Group Limestone formation. This trilobite is featured on the town's coat of arms and was named the "Dudley locust" or "Dudley bug" by quarrymen who once worked many of the now abandoned limestone quarries. Other trilobites found there include Dalmanites, Trimerus, and Bumastus. Spectacular trilobite fossils, showing soft body parts like legs, gills, and antennae, have been found in British Columbia (Burgess Shale Cambrian fossils, and similar localities in the Canadian Rockies); New York State (Odovician Walcott-Rust Quarry, near Utica, N.Y., and the Beecher Trilobite Beds, near Rome, N.Y.), in China (Burgess Shale-like Lower Cambrian trilobites in the Maotianshan shales near Chengjiang), Germany (the Devonian Hunsrück Slates near Bundenbach, Germany) and, much more rarely, in trilobite-bearing strata in Utah and Ontario. Trilobites are collected commercially in Russia (especially in the St. Petersburg area), Germany, Morocco's Atlas Mountains, Utah, Ohio, British Columbia, and in other parts of Canada. Chaisson, E. J. 2005. Recent fossils]. Cosmic Evolution Website, Tufts University. Retrieved December 20, 2006. Knill, R. and R. Fortney. Earliest combatants in sexual contests revealed in New Scientist 2501 (May 2005):16. Retrieved December 21, 2006. A Guide to the Orders of Trilobites. This page was last modified on 17 December 2015, at 16:08.